Lake Toma, amongst the stunning mountains of Switzerland, is home to the source of the Rhine. Leaving here it continues its journey through to the Netherlands, where it flows into the North Sea. On its way the biggest city it crosses is cosmopolitan Cologne. Cologne would only be half as beautiful without this fantastic river running through it. 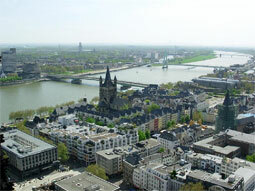 The Rhine gives this city a unique and relaxed atmosphere. 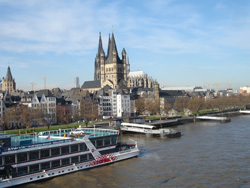 On its banks visitors to Cologne like to spend their time relaxing alongside the locals, known as ‘Kölner’! I am proud to call Cologne my home town and can speak to you at first-hand about life around this significant river of Europe. 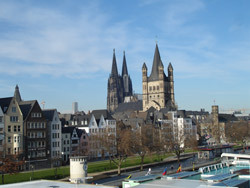 Hopefully I will also entice you to explore Cologne yourself! Do you want to experience an important part of German culture and one of the country’s most incredible festivals? In that case you definitely shouldn’t miss the November Carnival in Cologne! The traditions connected to this 5000- year old festival are just as diverse as the places where it is celebrated and even within Germany you will find numerous different customs surrounding the February carnival week that marks the beginning of Lent. However, there is no region where carnival is as firmly anchored in the local culture as in Cologne – experiencing the celebrations in the German ‘capital of carnival’ is something you will never forget! A bird’s eye view of Cologne! After recently returning from a German course in Cologne, I am happy to tell you how surprising and fascinating this city was! As a person who travels a lot and been to Germany several times, I have been round various castles, churches and cathedrals, both in Germany and at home in Spain. But, I’ve NEVER climbed up any historical building with a view which can compare with the one you get from the Cologne Cathedral! My (second) trip to Cologne! I got my first taste of Cologne in 2006, when I travelled there with a few friends during the Football World Cup and camped out with thousands of other fans on the meadows by the Rhine. So when it came to deciding on a location for my German course, I can’t say that I took a long time to think about it! 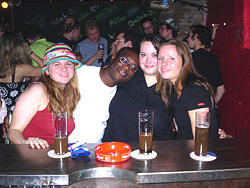 The memories of welcoming, friendly locals, the spirit of fun and excitement and all the sights and places that I hadn’t gone to on my first visit, immediately convinced me – I definitely wanted to go back to Cologne!. So, I travelled to Cologne to start my German course. The school was great, located right in the centre of the city, with great teachers and a great mixture of students from all over the world!